For the last six weeks, I’ve taken a very awesome online course on data visualization called “Introduction to Infographics and Data Visualization” It is sponsored by the Knight Center for Journalism in Americas and taught by the extremely-talented Albert Cairo. If you have a quick second, check out his website because it’s phenomenal. Anyways, we have reached the final week of the course and Cairo had us all make a final interactive project. He gave us free reign to do whatever we want. We just had to pick a topic we’re passionate about. Given that I was a cops and courts reporter for a year in Galesburg, Illinois before moving to Waterloo, Iowa, I am passionate about crime reporting. So I decided for my final project I’d examine states with high violent crime rates and see what other characteristics they have. Do they have higher unemployment rates? Or lower education rates? What about wage rates? Obviously, this is the type of project that could be expanded upon. I limited my final project to just four topics mostly because of time constraints. I work a full time job, you know! Anyways, here’s my final project. Let me know if you have any suggestions for improvement. Data: Information for the graphic was collected from four different sources, which are all listed when you click on the graphic. I took the spreadsheets from the listed websites and took out what I wanted, making CSVs for each of the four categories broken down in the interactive. Map: The shapefile for the United States was taken from the U.S. Census Bureau’s website. Find it by going to this link, and selecting “States (and equivalent)” from the dropdown menu. I then simplified the shapefile by about 90 percent using this website. Simplifying basically makes the lines on the states’ polygons less precise but dramatically reduces the size of the file. This is important because people aren’t going to want to wait all day for your maps to load. Each spreadsheet had a row for the state name, which matched the state names for each row in the shapefile. It’s important these state names match exactly. For instance, for crime data from the FBI I had to lowercase the state names. So I turned “IOWA” into “Iowa” before loading it into QGIS because all the rows in the shapefile were lowercase (“Iowa” in the above example). Then you can open the shapefile’s properties in QGIS and merge the data from the spreadsheets with the data in the shapefile using the “Joins” tab. Finally, right click on the shapefiles layer then “Save As” then export it as a GeoJSON file. We’ll use this with the wonderful mapping library Leaflet. Design: The buttons used are from Twitter’s Bootstrap. I used jQuery’s show/hide functions to show and hide all the element the page. This included DIVs for the legend, map and header. GeoJSON: The last thing I did was modify my GeoJSON file. You’ll notice how the top 10 states for violent crime rates are highlighted in black on the maps to more easily compare their characteristics across the maps. Well, I went into the GeoJSON and put all those 10 states attributes at the bottom of the file. That way they are loaded last on the map and thus appear on top of the other states. If you don’t do this, the black outlines for the states don’t show up very well and look like crap. Here’s GeoJSON file for reference. Hopefully that will help guide others. If you have any questions, feel free to drop me a line. Thanks! It’s been about two months since we launched our crime map for the city of Waterloo and so far, the response has been overwhelmingly positive. I’ve been proud of our fans on Facebook, in particular, who are using the map to make informed opinions on crime in the area. One of our fans actually counted every dot on the map to counter another fan’s claim that crime only happens on the east side of town. He found crime was almost equally spread across the town. In hopes that this data will be digested by an even larger audience, I launched the mobile/tablet equivalent of the map last week. The new app is fully responsive thanks to Twitter’s Bootstrap framework. If you haven’t check out Bootstrap, you really should. It makes designing websites for all platforms — desktops, tablets, mobile phones — about as easy as its going to get. I also went in and modified a lot of the CSS, changing things like the width of objects on the page from pixels to percentages. This ensures that the app looks great no matter how wide the screen you’re viewing it from is. Serving up the tablet version of the map wasn’t particularly difficult. It’s basically the same map on our site without the header and footer, which seems to load slower on iPads. It’s also designed to be flexible regardless of how wide your tablet screen is. The mobile version was more difficult. At this time, the mobile app does not have a map of the crimes. 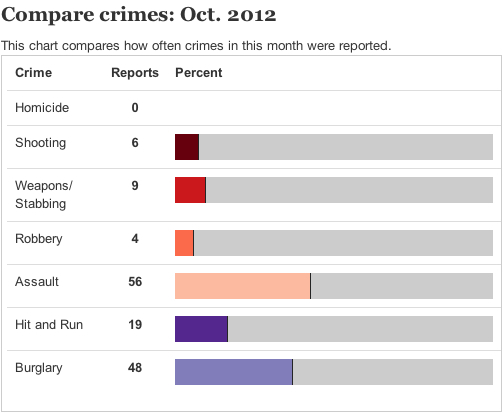 Instead, it’s just the color charts comparing different crimes and a table of all the crime data. I stripped out the map mostly because it’s difficult to click individual points on the map on small mobile screens. But screens continue to get bigger and nicer so hopefully this won’t be a problem in the future. One pro tip: I set the padding-right CSS property on the table of crimes to 10 percent. This gives a nice cushion to the right of the table, making it easier for people to scroll past it on smartphones with touch screens. For this project, I went about making the mobile version the completely wrong way: I opted to create just the desktop version at first and then go back and make one for tablets and phones. Ideally I would have done both at the same time, which is easy to do with Bootstrap. And that’s exactly what I did for another project we launched this weekend on campaign finance reports. The project exams the finance reports for candidates running in four local races. 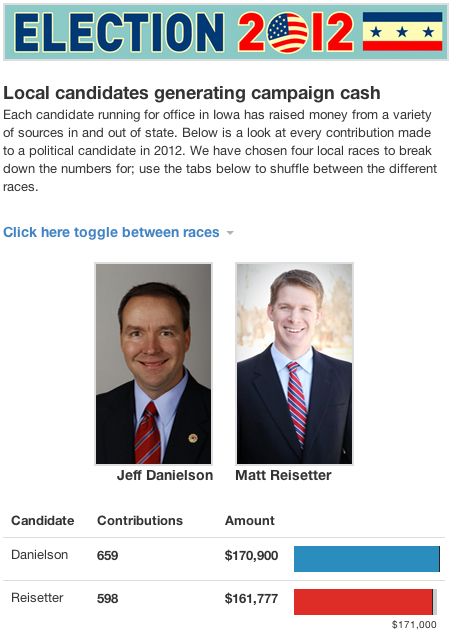 The reports are made available by the Iowa Ethics and Campaign Disclosure Board, which fortunately allows users to export the data into CSV files. We broke down the data and created bar charts using Bootstrap to compare the figures. The framework has several bar options to easily create the bar charts, which are worth checking out. The best part is they are designed to look good on all platforms. We also have databases of all the contributions that are searchable. This allows readers to see exactly where the money is coming from. For this project, I created the mobile and tablet equivalents of app as I was creating the desktop version. When viewing it on a desktop computer, the app is embedded on our website so it has the election header, footer and colors. The same app was created with responsive design in mind. So if you open it on a mobile phone, the app will look just as good on a tablet or smartphone as it does on a desktop computer. Many studies show that more and more people are getting their news on smartphones. It is imperative that we keep those readers in mind when designed full-scale apps for our websites. Hopefully we can continue this trend at the Courier and make sure our projects are reaching our full audience.